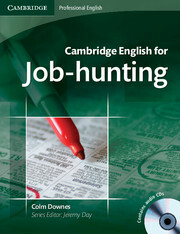 Cambridge English for Job-hunting is designed to develop the specialist English language knowledge and communication skills that job-seekers need to apply for and secure jobs. Ideal for both working professionals and those new to the world of employment, the course comprises six standalone units covering core areas such as CV preparation, cover letter writing, and answering interview questions. Authentic materials such as genuine CVs and cover letters give learners practical experience in understanding and preparing vital documents. The course also offers valuable advice to help improve job-hunters' confidence, including help with difficult interview questions and how to present yourself effectively. Authentic materials such as genuine CVs and cover letters give learners practical experience in understanding and preparing vital documents. Encompassing reading, writing, listening and speaking, this course develops all the communicative skills that job-hunters need, from understanding job advertisements to negotiating on job offers. 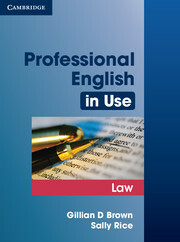 Professional English in Use Law is a brand new addition to the Professional English in Use series.